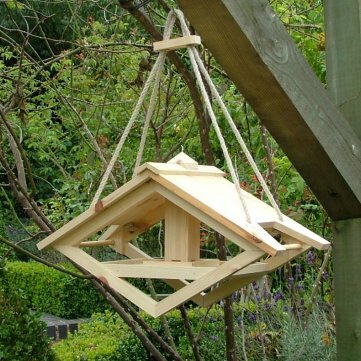 The Diamond Bird Feeder is a large, durable bird feeder/hanging bird table. Bird food is poured in through the top aperture and is stored, dry and clean, in the central pillar until pecked from the food hopper at the bottom. Measuring 58cm across and 37cm tall, it has a 33cm feeding deck and is suspended by rope from branch or hook. Made from Scandinavian pine and is shown here in green and brown, it is also available in our usual Golden Brown and clear finishes. Nuthatches are small birds that are readily distinguishable from any other bird you are likely to see. It is a plump bird, similar to a small woodpecker. Nuthatches are blue grey on their upper areas, from tail to the top of their heads. Underneath they are a chestnut colour, having a white-coloured facial area plus a prominent black eye-stripe along with a lengthy black pointed bill, as well as short legs. The females tend to be paler than the males and juveniles appear much like the females other than their colouring is very much subdued. controlling the populations of insects which could harm trees. At times they can be seen creeping along branches or down tree trunks, and unlike woodpeckers or treecreepers, they are able to descend head first. Nuthatches also feed on seeds and nuts and when it is on a bird table or bird feeder it is going to be the dominant bird, bossing the other birds that could be wanting to feed. 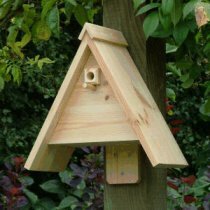 They also use nesting boxes, and will from time to time modify them by plastering the holes with mud. They dwell and also breed primarily in England and Wales, however are the occasional reports of breeding pairs from Scotland.